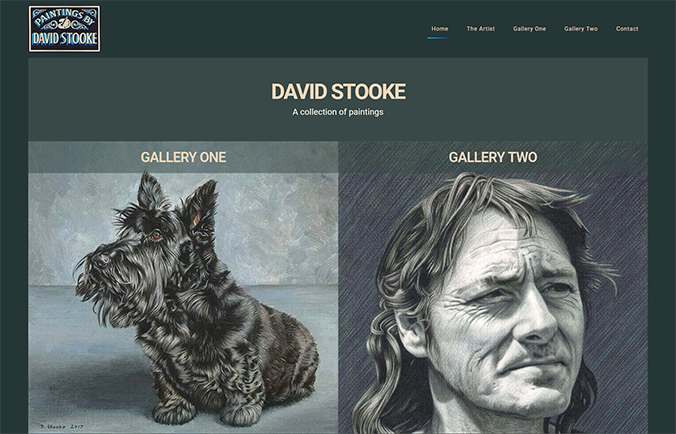 Artist website design for David Stooke has just launched. David has been a long standing client of Webbed Feet UK and wanted a new modern website to showcase his latest work whilst keeping some of the well know classics. David has painted anything from landscapes to seascapes, portraits of children and animals, vehicles, buildings, the golf courses and illustrations for books and album covers. To see the live website in action please visit www.davidstooke.co.uk. The website design itself is all about David and his work. The design reflects this with it's minimal colour palette. The difficult part of the design was making sure the images worked well in a grid system due to the images being different shapes and sizes. If David's website inspires you then please don't hesitate to contact us to see what we can do for you!